Despite advances in the medical treatment of heart failure, particularly the concurrent use of Beta-Blockers, ACE inhibitors and Aldosterone Antagonists, the outlook remains poor in those with more advanced disease. Cardiac Resynchronisation Therapy has brought about a further improvement in quality of life and survival, but the benefits of this are predictably limited to those with ventricular dyssynchrony. A variety of technical factors at implant can also hamper the effectiveness of CRT. Vagal Nerve Stimulation (VNS) may offer a more inclusive benefit to patients with heart failure. VNS has already been used since 1997 as an effective treatment for Epilepsy and more recently for drug-resistant depression. There is considerable evidence that in chronic heart failure there is an imbalance between the overactive sympathetic nervous system and the underactive parasympathetic system.1 This sympathetic pre-dominance is beneficial in acute cardiac events to maintain cardiac output, but chronically this imbalance is detrimental, contributing to LV remodelling, apoptosis of myocytes, fibrosis and electrical instability. The only marketed system for VNS in heart failure is the CardiofitTM (Developed by BioControl-Medical). This received a CE mark in December 2008 for the treatment of heart failure. Neuro-stimulatory impulses are delivered a set time from the R wave. If the heart rate drops too low stimulation is inhibited. All presets can be programmed remotely in the same manner as a cardiac device. In the pilot study (see below), the amplitude and the duration of stimulation are titrated up 3-4x week over a 3 week period until either a ceiling output was reached, a heart rate reduction of 5-10 bpm, or the onset of side effects. The most common side effects from vagal stimulation are cough, pain at the stimulation site or the mandible and dysphonia. CXR from a patient with both the CardiofitTM Vagal Nerve generator and an ICD. Kindly provided by BioControl Medical. The results of the first trial in humans (published in the European Heart Journal this year8) give early reason for optimism. 32 patients predominantly with NYHA class II-III had a VNS implanted, with the intensity of stimulation raised until limited by side effects or effective response as defined by a drop in mean HR > 5bpm. The cohort were largely male (94%), of ischaemic aetiology (62%) and had a mean LVEF of 23%. 97% were on Beta-Blockers and ACE inhibitors, and 53% were on an Aldosterone antagonist. The primary outcome was safety and tolerability. There were 3 deaths during the 6 month follow-up, all from end-stage heart failure with none attributable to the device. There were only 2 clear complications attributed to the device. 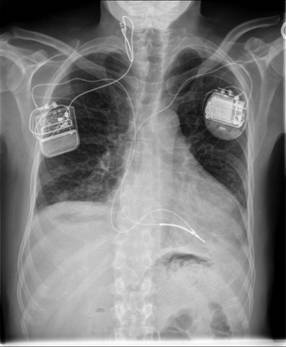 One post procedural episode of pulmonary odema, and one patient who needed his device revising due to a loose electrode connector. Predictable adverse events occurred as follows; pain at stimulation site (6 patients), cough (5 patients), dysphonia (4 patients), mandibular pain (3 patients). All these effects were ameliorated with stimulator intensity adjustments. Serial assessment of this cohort demonstrated a significant improvement in NYHA class, 6MWT, LVEF and LV volumes at 3 and 6 months. These benefits remained significant in the 23 patients followed to 12 months. There was only an average heart rate reduction of 1.5 bpm during Vagal Stimulation, (although baseline resting HR fell significantly over the trial period). This adds further weight to the belief that many of the beneficial effects of VNS are independent of heart rate reduction. A Randomized Study to Investigate the Safety and Efficacy of the CardioFit VNS has started enrolling this year from centres within the U.S., Italy, Germany, Holland and Serbia. It is hoped that some UK centres will be enlisted shortly. This prospective, open label, randomised controlled trial will aim to recruit 650 patients with heart failure to receive either a vagal nerve stimulator or optimal medical therapy in a 3:2 ratio. Inclusion will be restricted to patients in Sinus rhythm, NYHA class III on optimal medication, an LVEF < 40% and a mean daytime HR between 65-110bpm The primary efficacy endpoint will be a composite of hospitalization for heart failure or all cause death. The primary safety endpoint during the first 90 days will be system related complications, and beyond this time will be a non-inferiority comparison of time to hospitalization or complications. VNS is in its infancy and one would expect its efficacy and safety to be improved as implanters, programmers and device manufacturers follow a typical learning curve. There remain many unanswered questions. The current trial only focuses on one subset of the overall heart failure population. More trials will be needed to identify the magnitude of benefit in different cohorts. The dual role in patients with depression caused by chronic disease should also be accounted for to fully recognise the benefits of VNS. The role of VNS in patients with AF is a particularly interesting question. Not only may the benefit in patients in AF not be as marked, but it has long been believed that vagal stimulation can predispose to AF and atrial arrhythmias by shortening the atrial action potential duration9. Questions of how to maximize the benefit from VNS will be asked. Should heart rate response or side effects be used to guide the amplitude of therapy? Should vagal stimulation be pulsatile or continuous? Is left vagal stimulation as efficacious as the right? If so this would certainly hasten the development of devices that could deliver CRT, defibrillation and VNS. If the first randomised trials continue to show promise then VNS may need to be compared head to head with CRT, and a combination of CRT/VNS to find the most efficacious, tolerable and cost effective treatment strategy. 2. Springer J, Okonko DO, Anker SD. Vagal nerve stimulation in chronic heart failure: an antiinflammatory intervention? Circulation. 2004; 110: e34. Eng Med Biol Soc. 2005;7:7072–7075. 4 De Ferrari GM, Salvati P, Grossoni M, et al. Pharmacologic modulation of the autonomic nervous system in the prevention of sudden cardiac death. A study with propranolol, methacholine and oxotremorine in conscious dogs with a healed myocardial infarction. J Am Coll Cardiol 1993;22:283-290. 5. Zhang Y, Popovic ZB, Bibevski S, Fakhry I, Sica DA, Van Wagoner DR, Mazgalev TN. Chronic vagus nerve stimulation improves autonomic control and attenuates systemic inflammation and heart failure progression in a canine high-rate pacing model. Circ Heart Fail 2009;2:692-699. 6. Sabbah HN, Wang M, Jiang A, Ruble SB, Hamann JJ. Right vagus nerve stimulation improves left ventricular function in dogs with heart failure. (abstr) J Am Coll Cardiol 2010;55(suppl). A16.E151. 7. Schwartz PJ, De Ferrari GM, Sanzo A, Landolina M, Rordorff R, Raineri C, et al. Long term vagal stimulation in patients with advanced heart failure: first experience in man. Eur J Heart Fail 2008;10:884-891. 8. De Ferrari GM, Crijns HJGM, Borggrefe M, Milasinovic G, Smid J, Zabel M, Gavazzi A, Sanzo A, Dennert R, Kuschyk J, Raspopovic S, Klein H, Swedberg K, Schwartz PJ. Chronic vagus nerve stimulation: a new and promising therapeutic approach for chronic heart failure. Eur Heart J 2011;32:847-855. 9. Coumel P, Attuel P, Lavallee J, Flammang D, Leclercq JF, Slama R. The atrial arrhythmia syndrome of vagal origin. Arch Mal Coeur Vaiss. 1978;71:645–656.